In part, the Academic Preservation Trust (APTrust) is a consortium of higher education institutions committed to providing both a preservation repository for digital content and collaboratively developed services related to that content. The APTrust repository accepts digital materials in all formats from member institutions, and provides redundant storage in the cloud. It is managed and operated by the University of Virginia and is both a deposit location and a replicating node for the Digital Preservation Network (DPN). The APTrust consortium leverages the expertise of its members to identify and articulate needs for the digital content environment, to prioritize service development, and to collaboratively build solutions. This approach generates economies of scale and increases value for all members. The Governing Board is the primary governing body for APTrust; however, member institutions contribute actively to governance through input gathered by the Board. The Board defines and recommends strategic direction to help meet operational and strategic goals and provides advice and oversight for the budget and finances. The Board meets quarterly in person or by phone as needed and holds an annual meeting of the Board with all institutional members. APTrust is legally constituted as part of the University of Virginia. Activities and operating guidelines of APTrust are subject to the rules and policies of the University of Virginia, as are the contracts between individual member institutions and the University of Virginia. In the case of conflicts between APTrust operating guidelines and member institution contracts, contracts take precedence. APTrust includes a range of possibilities for volunteers to contribute in pursuit of its mission. One of those means of contribution is to sign up for a Work Group. Work Groups are usually considered for establishment by the APTrust Advisory Committee upon recommendation of one of its members or the APTrust staff, or upon assignment by the APTrust Governing Board. Structure varies according to the specific nature of the work involved, but commonly includes a leader responsible for overseeing the activities of the group and a reporter responsible for ensuring regular communication about those activities. Results of Work Groups are reported to the APTrust Advisory Committee and are further communicated by that committee to the Board as appropriate. Work Groups may be established for long-term projects, such as consideration of and preparation for trusted digital repository certification, or for short-term projects. 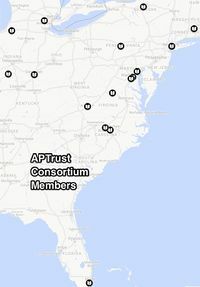 Work Groups are decommissioned when no longer needed by the APTrust Advisory Committee. The Trusted Digital Repository working group manages TDR requirements and assures that all documentation, policies and practices are in accordance to ISO 16363. This groupspace is a communication mechanism for the Bagging Interest Group and also serves to aggregate documentation on institutional bagging best practices. We hope tha this will help new members develop their own bagging workflows. To join the group, please add yourself to the Bagging Mailing List . Partner-Facing Service Management Reports is a description of a scheduled report, prepared for each separate partner institution, that shows their use of the service while demonstrating reliability and value to contacts at the partner institution. A self-subscription e-mail list/Google group open to all and designed to promote communication about the Academic Preservation Trust, active preservation of digital scholarly/cultural content and related topics. A collection of presentations given during the bi-annual APTrust meetings and other conferences. Links to old wikis/WARCs. All relevant content has been copied into this wiki.aptrust.org wiki. Preservation copy includes a Google sites file export of the wiki and a webcrawl as warc file. Old wiki with mostly content pertaining information about APTrust System (Fedora) 1.0. APTrust Groupspace Groupspace. Space for working and interest groups. Preservation Copy: Warc archive of May 15th 2018 as well as PDF export of website Access Copy: Webrecorder crawl 2017. Archival crawl of the Duraspace wiki as the website functioned in 2017. Some pages may be restricted or no longer work.